Christmas is in the air: Filipino shoppers are hopping from mall to mall, scouting for gift ideas, filling restaurants, and congesting roads. The flurry of activity, however, inevitably increases the probability of road crashes during the Christmas season. This Christmas, prevent misfortune from spoiling your holidays with these tips from Magnus Mateo, Road Safety Committee Vice Chairman of Motorcycle Development Program Participants Association, Inc. (MDPPA), the Philippines’ premier motorcycle manufacturers association composed of Honda, Kawasaki, Suzuki, Yamaha, and Kymco. 1. Focus on Riding. Everyone is excited about the holidays; after all, this is the season of parties, shopping escapades, and Christmas bonuses. But be sure not to let your wandering thoughts cloud your judgment while riding. Devote your full attention towards reaching your destination safely. “Ang tendency ng karamihan, hindi naka-focus,” Mateo says. 2. Stay Healthy. Not even the best motorcycle available in the market can spare a motorist from a fatal heart attack, shares Mateo. As such, one should always keep his health in check. Some health conditions pose side effects, which can impair the driver’s vision and sense of road awareness. “Pati constipation,” he jokes. 3. Don’t Drink and Ride. Having a little too much to drink can lead to numbed senses particularly blurry vision and slower reaction times. “If you are not in a fit state to ride, do not do so,” he cautions. And even if you just had a drink or two, you still have to be on your guard: be wary of recklessly drunk pedestrians, too! 4. Maintain your Bike. This might come as a surprise, but MDPPA discourages major motorcycle modifications since these can lead to unpredictable motorcycle performance. “Manufacturers conduct thorough research to get vehicle specs right,” says Mateo. 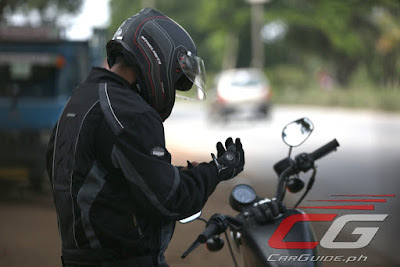 He advises riders to change oil and filter regularly, as specified in the owner’s manual. Daily visual inspection should include leaks, tire condition, brakes, pedal/lever plays, and signaling and head light devices, the latter serving as safety devices to help the rider be seen and see other motorists or pedestrians. One should be wary of any form of electrical malfunctioning, too. 5. Adapt to the Weather. What should riders do when it starts raining? Slow down and refrain from hard braking. “The road is slickest when it starts raining as the layer of dust and oil on the road surface is not yet washed out,” he explains. 6. Avoid Road Rage. Avoid road rage at all costs: this can lead to direct and indirect motor accidents. Reckless driving, lack of focus, and even the tendency to pick fights are just some of the drastic effects of extreme anger. 7. Plan Your Travels. Not only it will save you time, effort, and fuel from unnecessary movements, but also help relieve traffic congestion and reduce carbon emission from driving. Don’t let road accidents turn Christmas celebrations into tragedy. Follow these tips, to stay safe and merry during the holidays! And remember, road safety should be exercised everyday and not only during the Christmas season.